The NCAA followed recommendations Monday in the second annual report by U.S. Sen. George Mitchell which showed significant progress by Penn State university and the athletic department. They have decided to eliminate the football program's postseason ban and restore their bowl eligibility immediately. 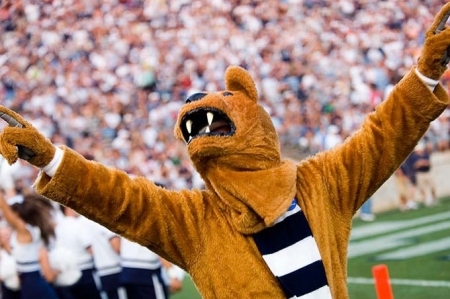 Penn State will also receive all 85 scholarships for the 2015-16 season. The original agreement between the NCAA and Penn State had the sanctions related to the Jerry Sandusky scandal running to 2017. Due to Penn State University's significant progress toward ensuring its athletics department functions with integrity, the NCAA Executive Committee today eliminated the school's postseason ban, effective immediately, and will return the full complement of football scholarships in 2015-16. The committee's action endorses recommendations released today by George Mitchell, the university's athletics oversight monitor, in his latest report. "Penn State's commitment to the integrity of its athletics department and its progress toward meeting the requirements of the Consent Decree are clear," said Northern Arizona President Rita Hartung Cheng, who chaired Monday's Executive Committee meeting. "We thank Senator Mitchell for his meticulous and exhaustive work over the past two years. Mitchell's efforts and the dedication of Penn State officials made today's decisions possible." Executive Committee leadership met Monday with the NCAA Division I Board of Directors and presidents from the Big Ten Conference prior to taking a vote on the action. During these discussions, Mitchell briefed the group on his work to date and the university's compliance with the athletics integrity agreement. The Board of Directors also accepted Mitchell's report and endorsed the Executive Committee's action. "Penn State has made remarkable progress over the past year," said Harris Pastides, Board member and University of South Carolina president. "The board members and I believe the Executive Committee's decision is the right one. It allows both the university and the association to continue to move toward a common goal of ensuring that educating, nurturing and protecting young people is a top priority."